The rain and cold weather disappeared. The day started off a little cold – sweater and jacket, but by the afternoon, I had shed both. We had a beautiful blue sky and a lot of sunshine. 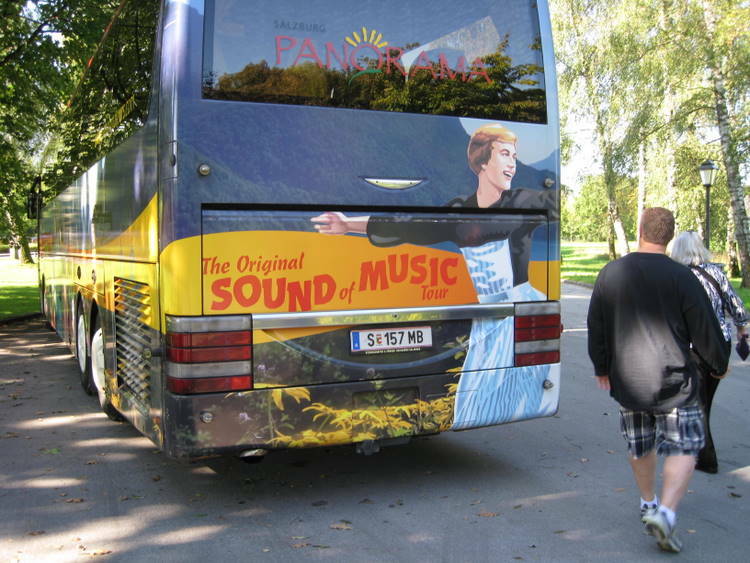 Today was our Sound of Music Tour. A van picked us up at our hotel and took us to the tour bus. There were two couples from Vancouver on the van. Two large tour buses were the transportation for this tour. It was a fun trip. The story told in the Sound of Music is a true story of the VonTrapp family who lived in Salzburg – he was a captain in the navy and a Baron. 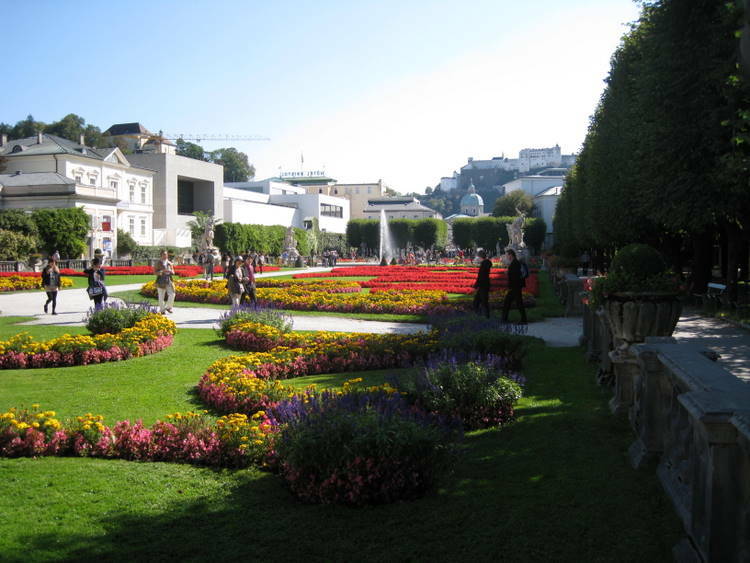 They escaped Salzburg rather than submit to Hitler. 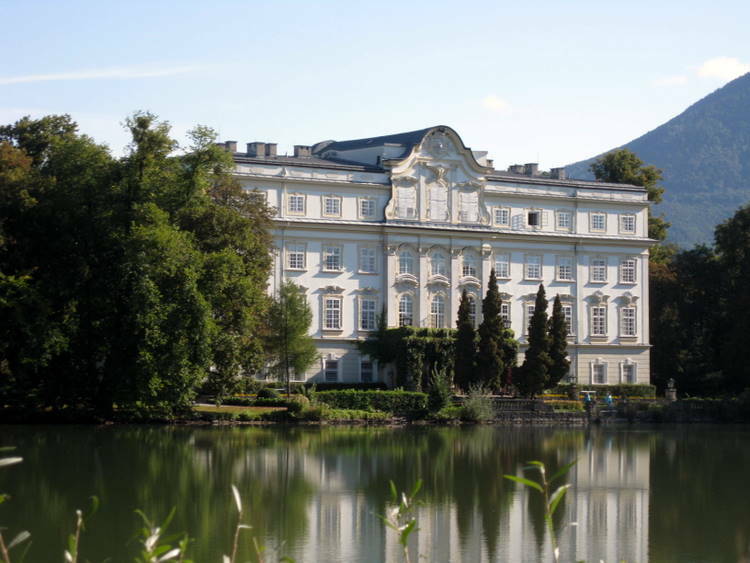 The entire outside and some of interior shots in the movie took place in Salzburg. We had an excellent guide who narrated about every stop. 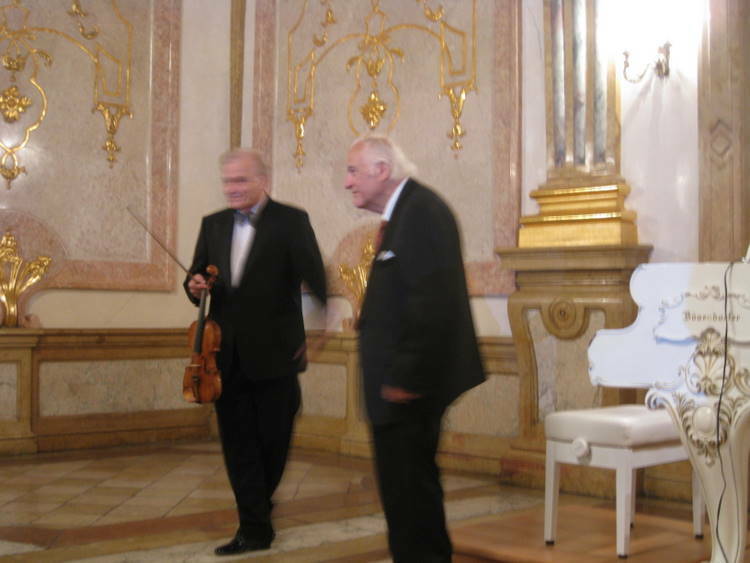 He told us that the people of Salzburg did not know the “Sound of Music”. He told some amusing stories about this fact. While on the bus the music of Sound of Music was played and everyone sang. The first stop was across a small lake from Leopold’s Crown Palace. It was where Maria and the children stood up in their bo at and fell into the water. 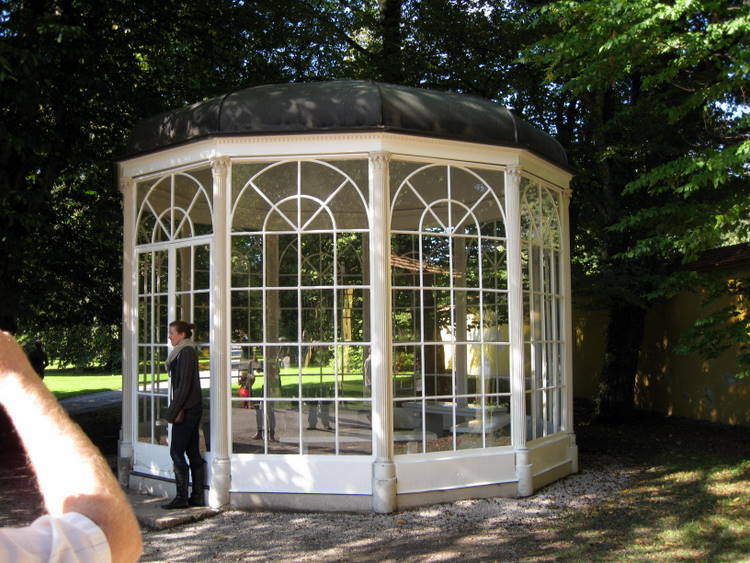 The next stop was the gazebo where Liesl and Rolf sang “Sixteen going on Seventeen”. The gazebo was locked because an 80 year old lady was hurt jumping from bench to bench while singing as was seen in the film. My wife was very disappointed as she had her heart set on doing that. From there we went up into the hills and stopped on a hill where part of the movie was shot. The hill at the beginning of the movie is privately owned and no longer available to the public. 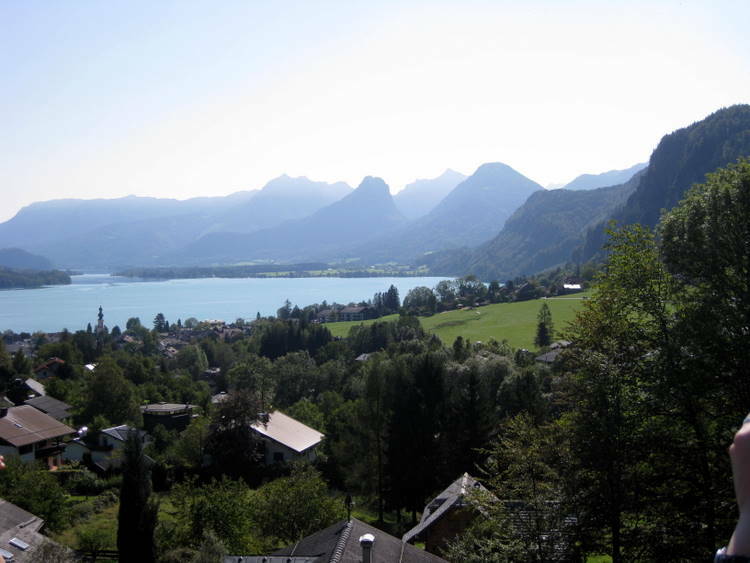 The next stop was in Mondsee. 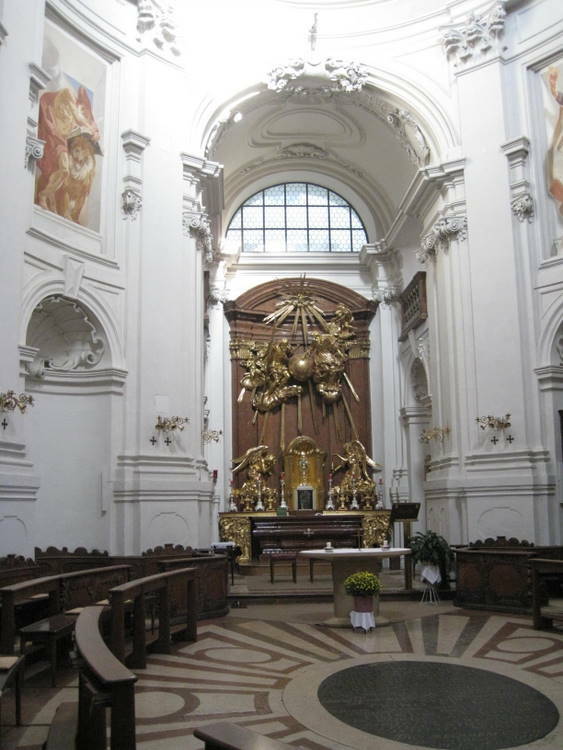 It is here in the Basilica of St. Michael that the wedding was filmed. In real life the Captain and Maria were married in the Nonnberg Abbey where Maria was a novice. 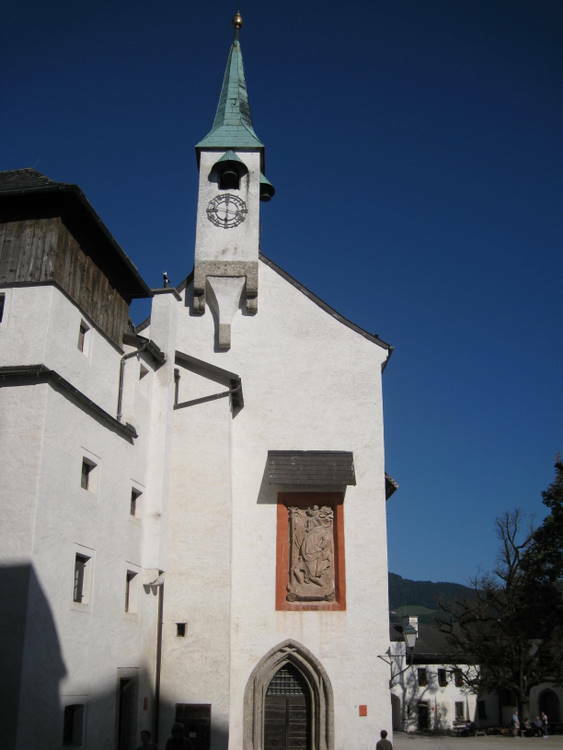 The chapel was not large enough for the filming so the church in Mondsee was chosen. The exterior of St. Michael’s is striking, and except for the three cross on the towers and center, the façade could be mistaken for a structure other than a church. The building is yellow with white columns framing the two towers and dividing the center section into three parts. The center section, which is four stories is concave between the two towers. Over the two center doors are two windows on each floor. The top level has two niches with statues. Each floor of the tower has matching windows and a clock. The top dome is square. The first building on this site was consecrated in 1104. It is reported that this church was in deteriorating condition in 1338, but the reconstruction did not begin until the 15th century. A Baroque reconstruction of this Gothic church was planned around 1700 but the only part that was actually built was the façade. There was a fire in 1774, after which there was considerable rebuilding. The north tower, in a bad state of disrepair, was demolished in 1963 and rebuilt in 1967. The most comprehensive renovations took place as recent as 2004-09. The inside is magnificent, especially the ceiling with pink ribbing. 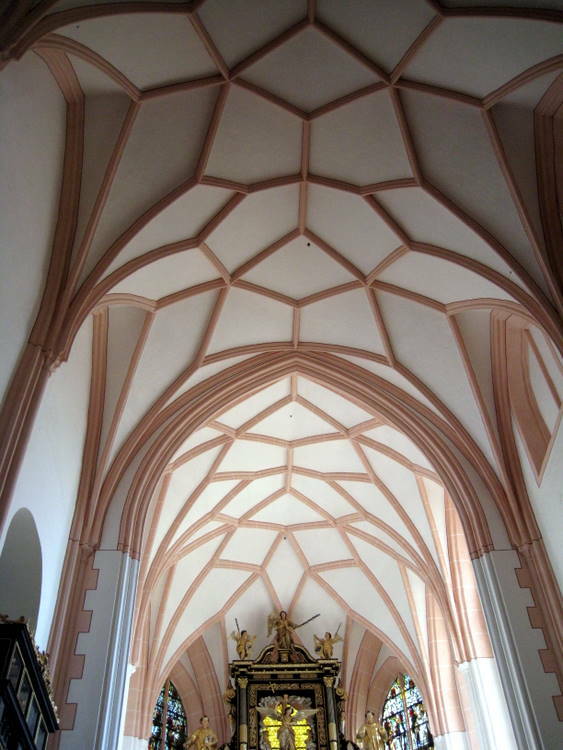 The design is known as a form of hexagonal rhombus stars. A rhombus design is where each side of the hexagon is of equal length. 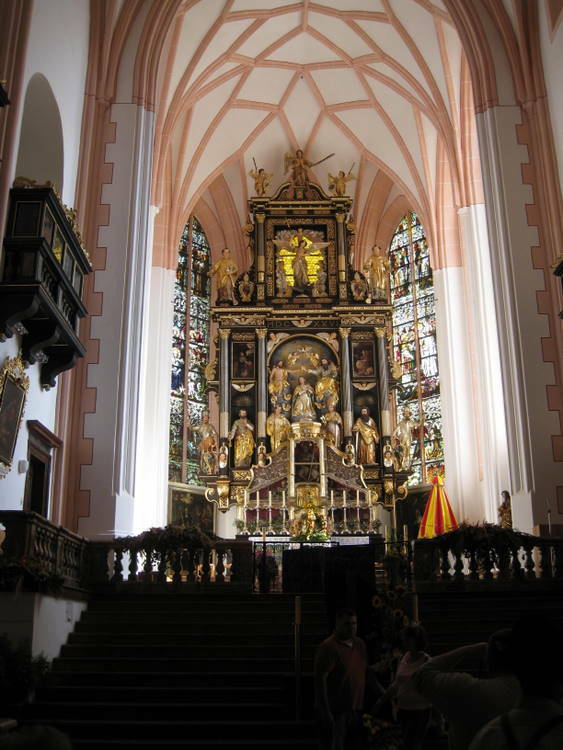 The early Baroque high altar, dating from 1626 is almost 60 feet high. 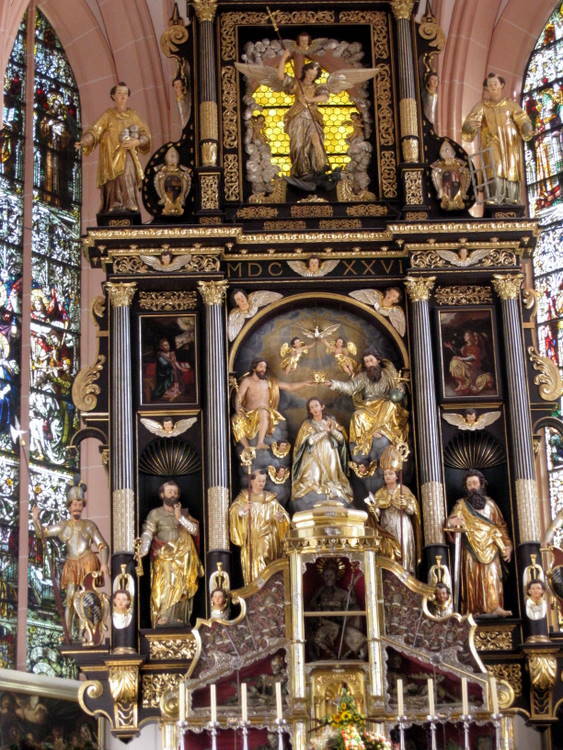 The dominant and central scene on the altar portrays the Coronation of Our Lady by the Holy Trinity, witnessed by St. Benedict and St. Wolfang. The coronation scene is flanked by the figures of the apostles Peter and Paul. The center of the superstructure is occupied by the figures of the archa ngel Michael, flanked by St. Stephen and St. Laurence. We had stopped in Mondsee for an hour so we could also have lunch. We ate in an outdoor café that was famous for its warm apple strudel, so that was lunch. Sitting at the next table was a couple from Warrenton, Va. The tour lasted 4 hours. Now we have to go home and watch the video of Sound of Music. The bus trip ended at Mirabel Gardens which is just a few blocks from the hotel. We walked through the garden with all of its beautiful flowers. We stopped by the hotel to leave our jackets, then went back to old town. There were a lot of people and excitement around the old town and especiall y in front of St. Rupert’s Cathedral, as this was the beginning of a festival called Salzburger Ruperti-Kirtag. It is honor Salzburg’s patron saint – Rupert. The festival runs from September 21st to the 25th. Locals and visitors change into their lederhosen or dirndl dresses, join the crowd and enjoy this popular mix of traditional music performances, artisan’s stalls, children’s entertainment, a fun fair and regional delicacies fresh from the market. We found the funicular that goes to the castle. It was a beautiful way and the views were spectacular. The size and shape of the church in the old town section were easily identified. We were able to get a better understanding of some of the architecture. 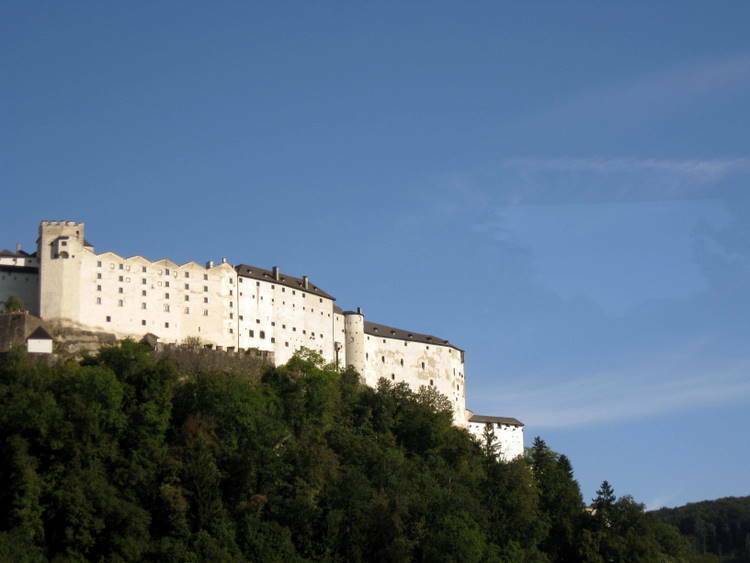 The Hohensalzburg or Salzburg Castle can be seem from almost anywhere in Salzburg. I hav e a MODEL of it that I just began, but didn’t finish before the trip. 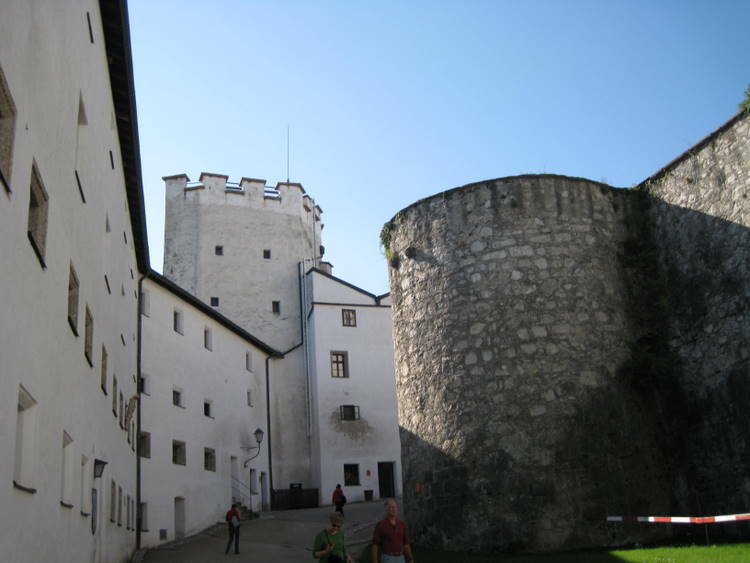 The castle/fortress was found in 1077 and is the largest preserved medieval fortress in Central Europe. 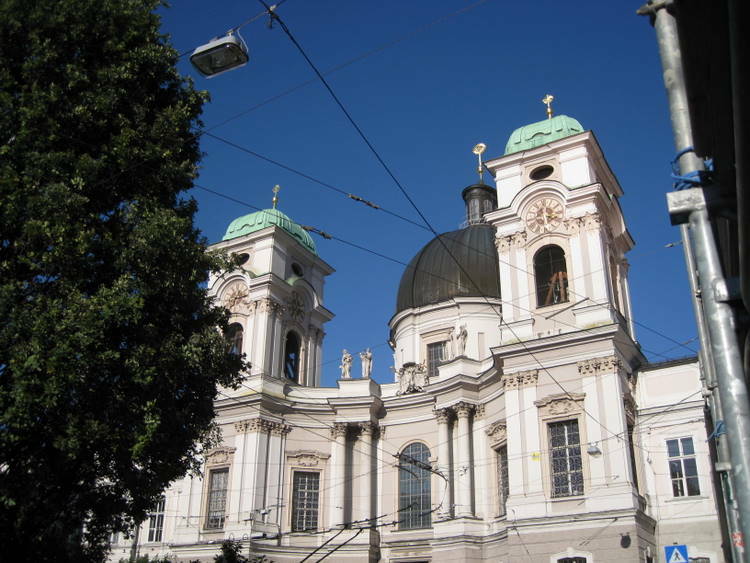 It was originally founded by Salzburg’s Archbishop Gebhard, who had supported the pope in the investiture controversy against the Holy Roman Emperor. Over the centuries the archbishops gradually enlarged the castle. Sometim es they used it as a residence and often for protection from invaders. The ride up the fu nicular was spectacular as it was a very clear day. The size and the shape of the churches in the old town section were easily identified. 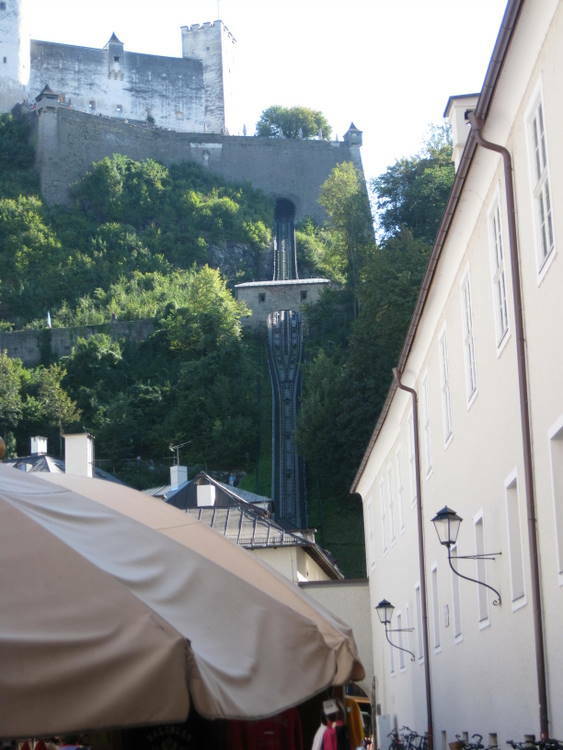 The funicular ended at a lower terrace which faced the town of Salzburg. At that level there was a tower with many steps up to the door. We decided we didn’t want to attempt that and maybe there was another entrance. We walked around the side and found a set of step leading to a lower level. My wife sent me on test run to see what was do wn there. 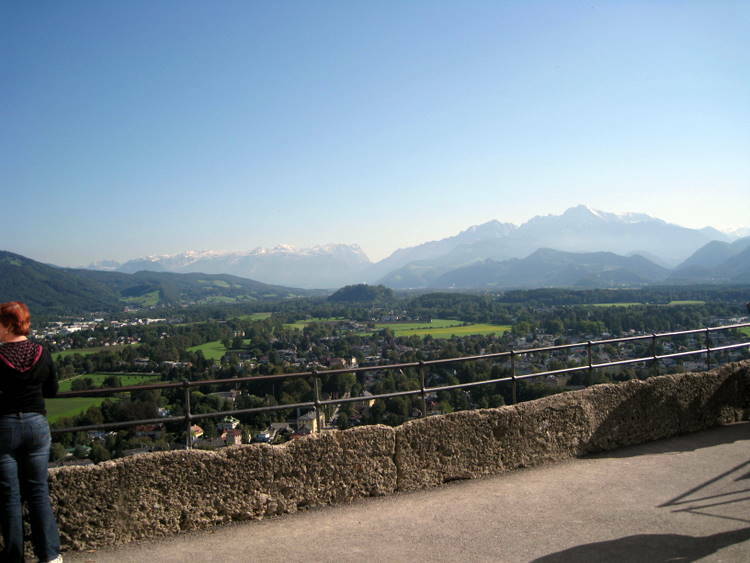 It offered a wonderful view from the other side of the castle towards the mountains. She came down and then we walked up another flight of steps to a wonderful terrace with a spectacular view. There were more steps leading into the upper wall. At that point she decided not to tackle any more steps. She had walked to the top of the castle about twenty years before. So I ventured up and walked around all of the areas that I had remembered on the model. Of interest was ST. GEORGE'S CHAPEL whi ch was a small chapel which contained a 200 pipe organ from the beginning of the 16th century. 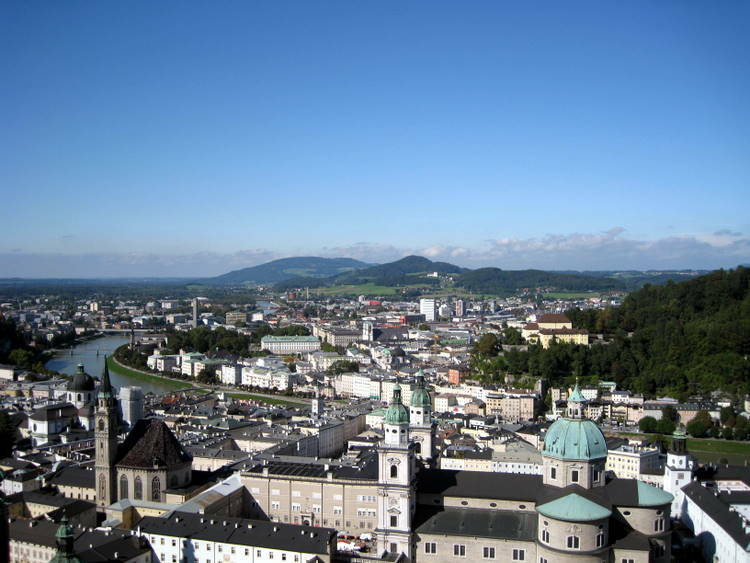 Click here to see my model of Hohensalzburg. We took the funicular back down and walked through St. Peter’s graveyard which is b ehind St. Peter’s church. It dates back to the first half of the 17th century. 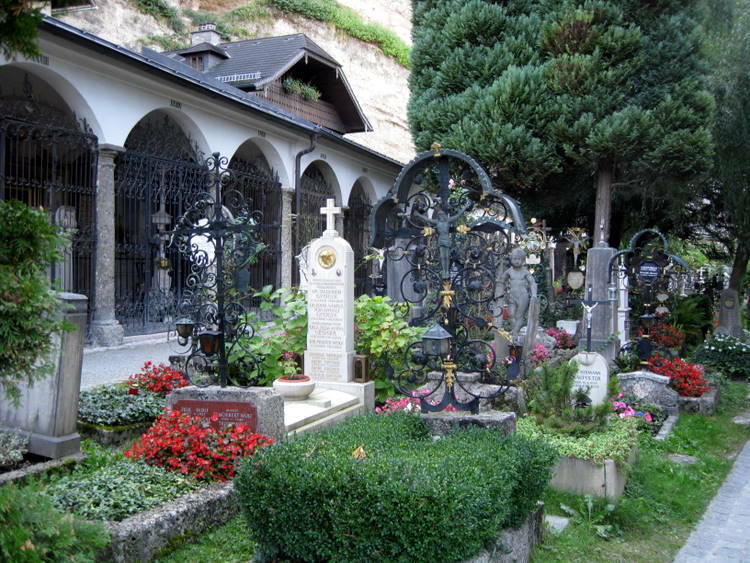 There is small church, Chapel of St. Margaret, in graveyard. It was not open. There were very interesting gravestones and many of the grave sites were planted with bright red flowers. On the left side – towards the castle- were three cave chapels built into the wall. They had once served as hermitages for the monks associated with St. Peter’s. They were open to the public, and we could see people passing some of the windows, but we didn’t go in. We talked back through old town, across the bridge to our hotel. My wife got some ice for her knee and took a nap. I went to see a church nearby – The Church of the Holy Trinity. The Church of the Holy Trinity was completed in 1702 with changed made in 1757 and aga in after the fire in 1818. 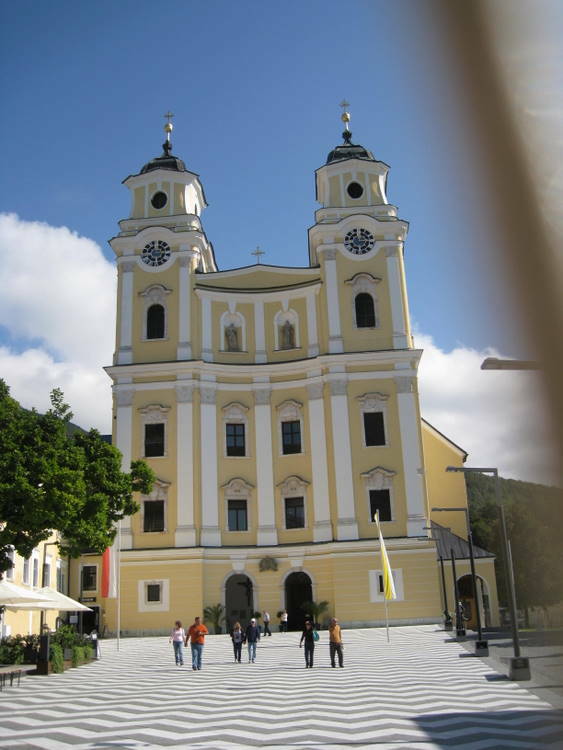 The front of the church has two flanking towers with a concave front between them – much like the church in Mondsee. In the center is a large dome with a copper colored top. The two towers have green roofs. Upon entering the church, there is immediately an iron fence and gate. It was locked but I could get a good look at the interior which was topped by an elongated cupola. The chairs were around the enlongated floor. The altar piece was very Baroque, consisting of brass figures of the Trinity near the top. God, the Father has his hand on a very large brass sphere, while Jesus is holding a cross and above the Holy Spirit, represented as a dove has streams of brass light radiating from it. I stopped at a nice bar in another hotel. I was the only person in there. We needed to find a place for a quick dinner as we had tickets to a concert in the Mirabell Palace. Our hotel had an attractive café in addition to the dining room so we had a light dinner there. This evening we planned to go to the Mirabell Palace for a concert. 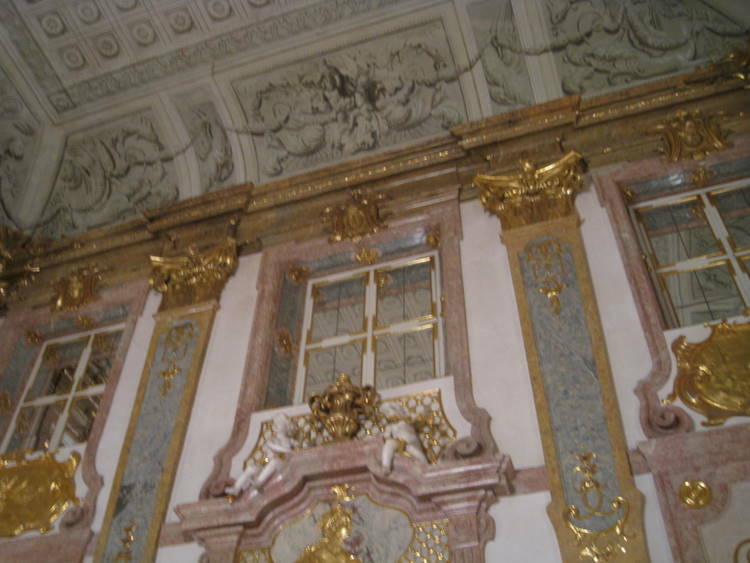 We had ordered tickets a long time ago as seating is limited and tickets are hard to obtain..
Mirabell Palace was built in 1606 by a very wealthy and powerful Prince-Archbishop Wolf-Dietrich for his mistress, Salome Alt, and their 15 children. Because of its great beauty, it was taken over by succeeding prince-archbishops. It received a facelift in 1717. The disastrous fire of 1818 destroyed much of the palace. 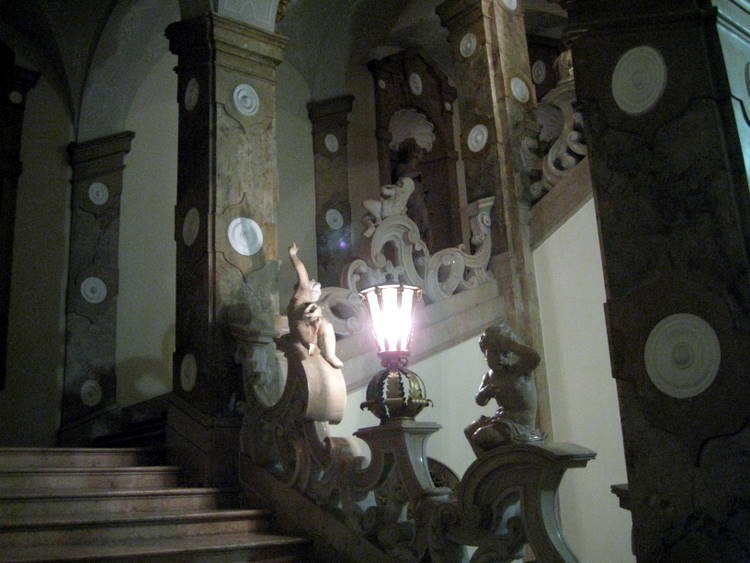 Three of the most spectacular parts of the palace – the Chapel, the Marble Hall, and the Angel Staircase survived. 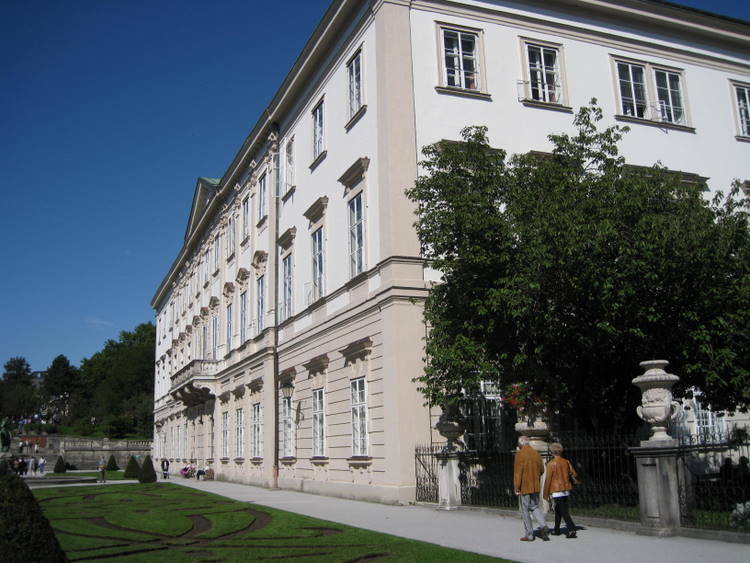 Today the Palace serves as a municipal office and the seat of the mayor of Salzburg. The concert was in the Marble Hall which was on the second floor. There were no elevators so we walked up the beautiful Angel Staircase. This staircase with sculptures by Georg Rafael Donner, is draped with white marble putti (little angels), whose faces and gestures reflect a multitude of emotions, from questioning innocence to jeering mockery. We arrived in the ante-room of Marble Hall a few minutes before the doors opened. The walls of Marble Hall were all stucco marble, the ceilings must have been 40 feet tall. Everything was beautifully Baroque. The concert featured Jorg Demus, an 83 pianist and a violist, Luz Leskowitz. They played Schubert, Mozart, Beethoven, Debussy and Franck. Jorg Demus played three long Impromptus by Schubert without any sheet music. What agile fingers for someone his age….ten years older than I am! The hall held about 100 chairs and was full. The acoustics were wonderful. We sat next to a couple from Miami. We walked back home and to bed after a very nice day. Tomorrow is our last day.